I have been getting work doing makeup on short films lately, but I think I could be doing better. Being a freelance makeup artist can be a bit lonesome and confusing at times. 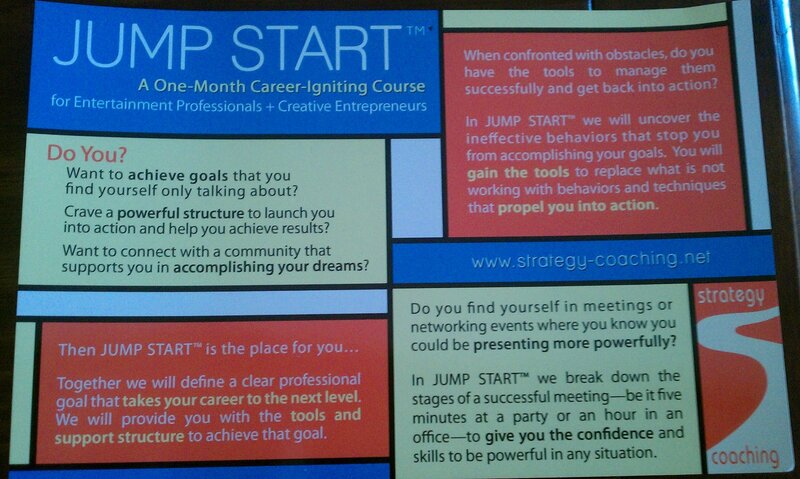 This evening I am attending a free Jump Start Intro course. It’s part of Strategy Coaching’s promotion for their one month Career-Igniting Jump Start Course led by professional career coach Shawn Tolleson. I saw her speak at the last Hair and Makeup Artist Network meeting and she has some really good advice, so I am interested in see what else she has to say this evening. I will let you know what I think of the intro course. Clearly articulate your next breakthrough goal and a strong plan to accomplish it. Identify your brand and learn to share it powerfully. Learn the skills of Pitching Yourself Powerfully™ in any encounter, meeting or networking event. Get feedback on how you occur when you are presenting or meeting people for the first time. Learn how to present authentically and powerfully. Identify the right mentor for where you are in your career and effectively approach that mentor. Identify your current relationships as well as relationships you need to cultivate for your success and the tools for doing so. Learn to identify your core motivation for every action you take in life and how to shift ineffective actions into effective actions to accomplish your goals. Learn the biological roots of fear and how to move past it in the moment when you are stopped by fear or confusion. Gain new relationships and resources, a new team of people around you, and coaches supporting you. Get out of your comfort zone. Make bold, appropriate requests that produce results. Gain individualized support and accountability so as to manage the ups and downs powerfully.